Today I am finally sharing my pattern for the Mia Grace Baby Blanket. It came out so cute. 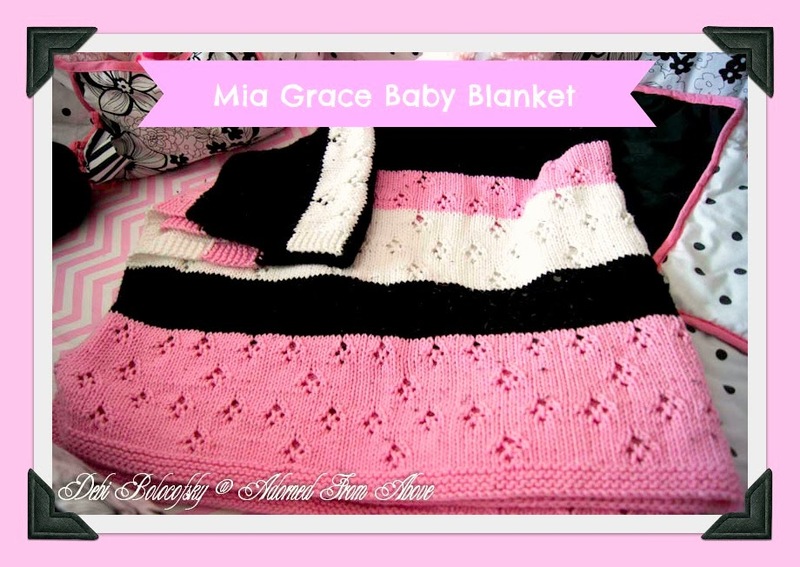 I can't wait for her arrival to see her all wrapped up in this sweet blanket for the holidays. The pattern is pretty simple. Just make sure that you use a row counter and count. 2. Knit first 5 rows. 14. Continue in pink and knit next 5 rows. Like I said, the pattern is not that hard, you just have to keep track of your rows and colors. If you have any questions, please feel free to contact me. Labels: Home Decorating Project, Knitting and Crochet Patterns, Misc. Beautiful blanket and your provided such intricate details! Thanks so very much. I love the way it came out also. Have a great week. I'm so happy that you like it. Let me know if you need anything, when you start it. 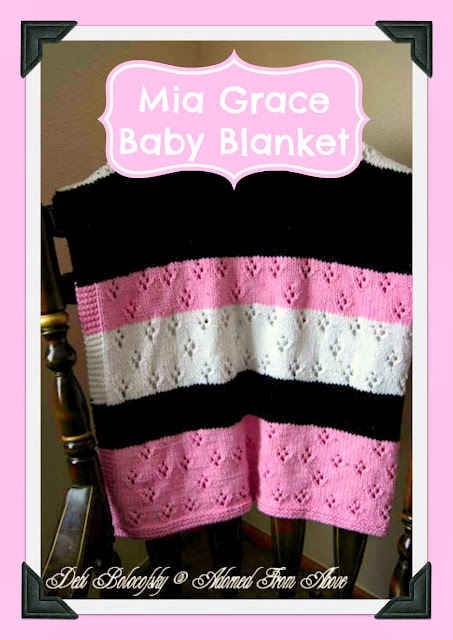 Very very pretty blanket- I want to do one for the next baby in our family! Thanks so very much. I hope you enjoy making it. how many do you cast on? Very pretty colours and pattern Beautifully done Debi! I love the way it came out. It is just so pretty and perfect for the nursery. What size blanket does it make? It makes a blanket that is approximately 40 X 38 after washing. Let me know if you have anymore questions please let me know. If I wanted to make it a little smaller, what is the stitch count for the pattern (multiples of) so that I could decrease it slightly? I think it is mutiples of 14, but I'm not at home right now to look at the pattern, so I'm not sure. I can let you know next week. I could't answer by email, since I don't have your email address, so I will post back here next week. We do not have that particular yarn in our area. I found a bulky cotton baby yarn, but it seems too thick of a stitch, Is the yarn you use, a finer yarn ? What could I replace it with? Thanks, I love the look of your blanket and really want to make one. It is considered a medium weight yarn, not a fine yarn. If your yarn is numbered in your area, it would be maybe a 3 or a 4. Otherwise I would just use a soft cotton medium weight yarn. I don't know where your are so it is hard to be more specific. If you let me know where you are I might be able to help find a yarn. Thanks so much for stopping by and I'm so happy that you like the blanket pattern. Have fun. I am from York, PA. I checked the craft stores in this area and the only cotton baby yarn I could find was the Lion Brand, which is a 5. That explains why it looks so big. They didn't have the black, either. Now that its getting cooler out, I am ready to start another project especially since there are several babies due this year, Love your work. Thanks for getting back to me. We have family friends who are from York. They moved to Del Ray Be each in Florida 2 years ago. My suggestion is that you could buy the yarn online from Hobby Lobby. They would probably have the yarn or something similar, that is where I bought the yarn. I don't use the baby weight yarn because it is so thin it takes a lot longer, but it is a large baby blanket so it would probe ably work out OK. Thank you! I will check that out, have a good day. Your welcome. Have a great week. I'm sorry it took so long for me to answer. I have recently moved and I am slowly working on the blog again. I can't answer you by email, because you are a no comment blogger which doesn't send you email address. If you send me a message with an attachment I can try to help. Are the eyelets coming out in a diamond shaped pattern? I can try doing a swatch again, also to see what is going on, but it would be easier if I can see a picture of what you are doing. My direct email is debrabolocofsky@gmail.com, which may be better for going back and forth on the pattern.